Two things always strike me when I hear parents talking about their kids and technology. The first is a palpable anxiety about their kids getting left behind in a world of rapidly changing technology. But this is a misplaced fear, or rather, it is a fear particular to the digital immigrant, not the digital native. Part of the skill set that comes with having grown up digital is a certain facility with new technologies. It comes “naturally.” Try to remember the last time you witnessed someone under the age of 30 reading an instruction manual. Exactly. The second is the reduction of technology to a means of achieving financial security. I take this to be what the parent quoted above meant by “being on top of the world” (or else they’ve watched Titanic one time too many). But students recognize that there is something deeper going on. Their ubiquitous technologies are nothing short of accessories to their humanity. The intensity of the withdrawal symptoms experienced when these tools are for some reason taken away or are disconnected suggests that without these tools those who have grown up digital have little idea of how to be in the world. Or rather, it is as if world is no longer the one they know and are comfortable inhabiting. You might as well be cutting off their oxygen. Reducing the significance of technology to some silly “you’ll need these skills to get a good job” pep talk does not come close to doing justice to the place these tools have in student’s lives. Students say that their parents, worried about the distractions, try to police computer time, but that monitoring the use of cellphones is difficult. Parents may also want to be able to call their children at any time, so taking the phone away is not always an option . . . 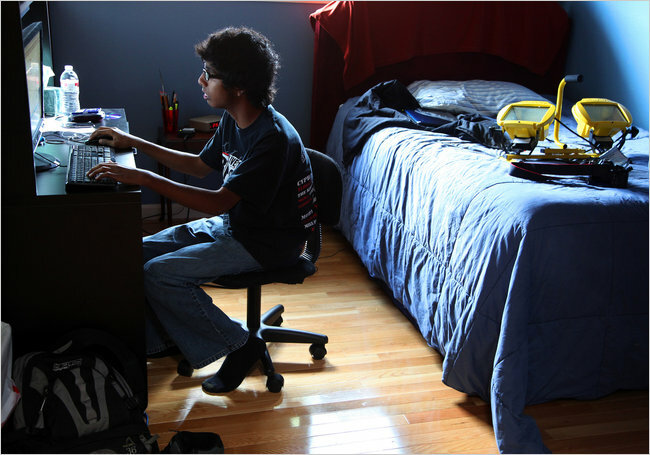 He says he sometimes wishes that his parents would force him to quit playing and study, because he finds it hard to quit when given the choice. Two things here. This is an instance of what Thomas de Zengotita has labeled “Justin’s Helmet Principle.” Sure Justin looks ridiculous riding down the street with his training wheels on, more pads than a lineman, and a helmet that makes him look like Marvin the Martian, but do I want the burden of not decking out Justin in this baroque assemblage of safety equipment, have him fall, and seriously injure himself? No probably not. So on goes the safety crap. Did we sense that there was something a little off when we started sending off our first graders to school with cell phones, just a fleeting moment of incongruity perhaps? Maybe. Did we dare risk not giving them the cell phone and have them get lost or worse without a way of getting help? Nope. So there goes Johnny with the cell phone. Then there’s this matter about not being able to quit, even wishing parents would impose limits. Your instinct may be to say, “Get over it, find the off button, and get to work.” Right, cut off the oxygen and tell them to breathe. Easier said than done. I’m not interested in eliminating personal responsibility, nor do I believe that these tools are by themselves the cause of the problem as if they were conscious agents. But . . . embodied creatures that we are, our mind is not simply an organ of disembodied, spontaneous will. This is to say that our will is intertwined with the action of our body in such a way that habituated action shapes our disposition and ability to make choices. We shape our will by repeated and then habitual practices. This is not new information — Aristotle knew this in his own way — although it is being reinforced by recent cognitive scientific research. The researchers looked at how the use of these media affected the boys’ brainwave patterns while sleeping and their ability to remember their homework in the subsequent days. They found that playing video games led to markedly lower sleep quality than watching TV, and also led to a “significant decline” in the boys’ ability to remember vocabulary words. The findings were published in the journal Pediatrics . . . Researchers say these studies have particular implications for young people, whose brains have more trouble focusing and setting priorities . . . . Like Dr. Rich, he says he believes that young, developing brains are becoming habituated to distraction and to switching tasks, not to focus. As I indicated last time, this is the hope. Sometimes I share it. In my own teaching, I’ve sought to avoid the introduction of technology for technology’s sake, but I have also experimented with class blogs, Wikis, multi-media presentations, Facebook related projects, etc. Results have been decidedly . . . mixed. More often than not, I tend to think that immersion in our digital media environment may very well erode (or more dramatically, cannibalize) the skills and dispositions associated with print so that it cannot be merely a matter of adding one skill set to the other.
. . . in Vishal’s case, computers and schoolwork seem more and more to be mutually exclusive.